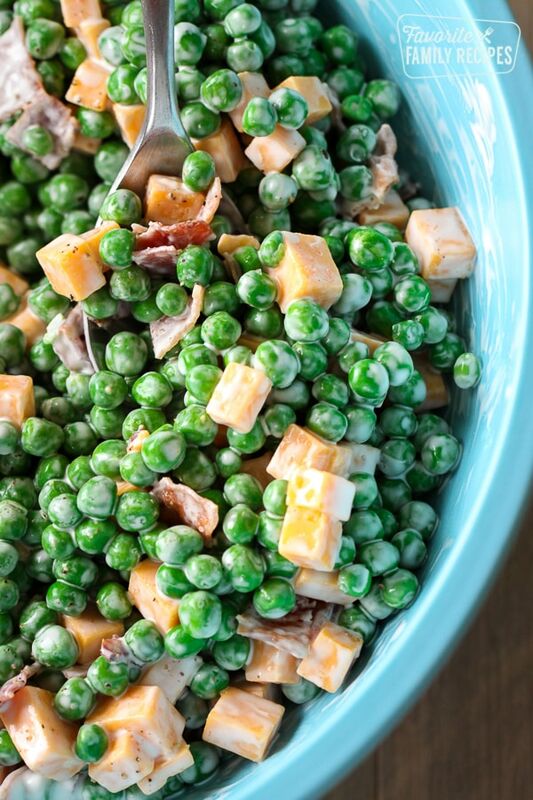 Pea Salad is always a favorite side dish at BBQs. You will love how EASY it is to make! Keep it simple or add more mix-ins for added flavor. 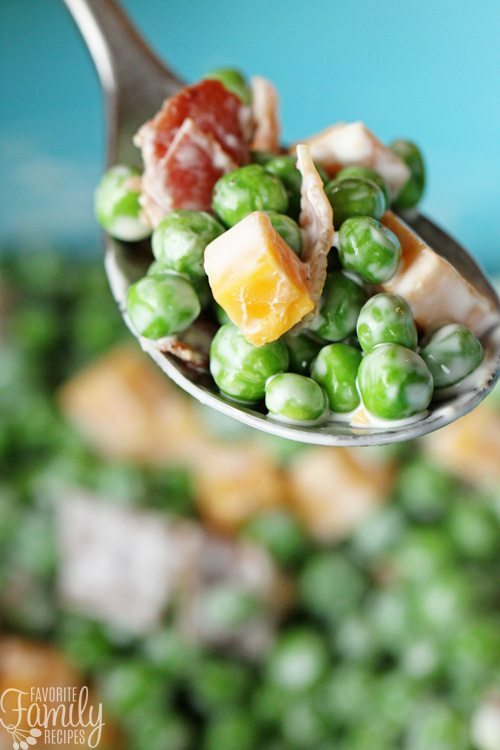 Crisp green peas are a spring and summertime staple around here. Whether fresh from your garden or frozen from a bag, peas just add the right amount of vibrancy and pop to so many dishes. 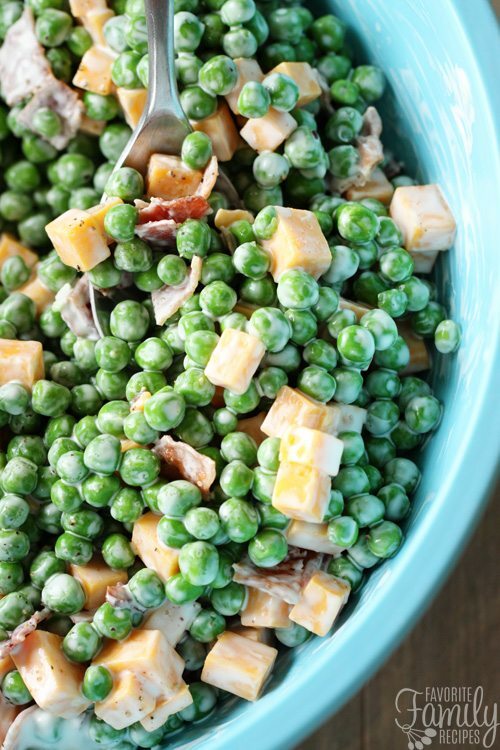 This creamy, green pea salad is the perfect side dish to complete your next patio picnic. The most common substitution people make with pea salad is the dressing. If you aren’t big on the idea of mayonnaise you can use Greek Yogurt instead. You can add a little extra vinegar to give it a little more zing. Some people like to use Miracle Whip instead of mayo as well. You can also just straight up use Ranch dressing or even Italian dressing if you don’t want it creamy. So many options! Is Pea Salad low carb? YES. Pea Salad is a great alternative to many other kinds of salads or side dishes. It’s always nice to have a low-carb option at potlucks or BBQs. It really isn’t bad as it is but there are definitely ways to make it healthier! As mentioned above, you can use Greek Yogurt instead of mayonnaise of you can even use a light Italian dressing. 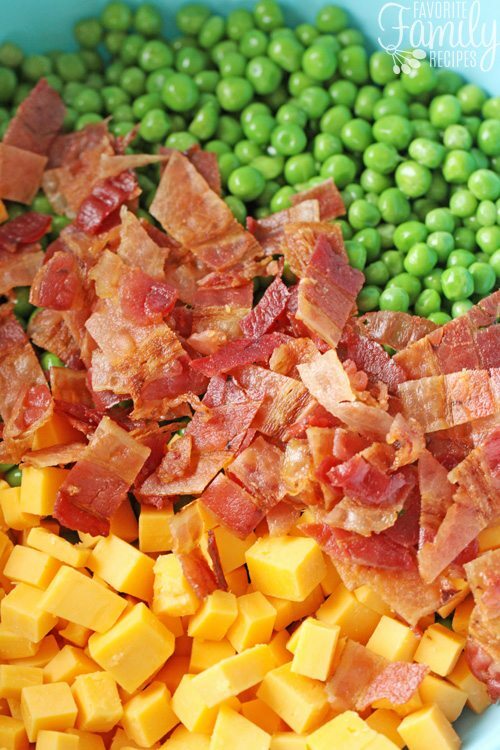 You can also swap out the bacon for turkey bacon and use less cheese (you can shred the cheese to make it go further). Use some of the above mentioned mix-ins to add additional flavor if needed! Is Pea Salad Gluten Free? YES! Pea Salad is completely GF. There are really no “iffy” ingredients when it comes to this recipe. If you are wanting to bring a gluten-free side dish to a potluck or BBQ this is a great option! Place frozen peas in a colander and rinse with cold water to thaw. It doesn't need to thaw completely. Just enough so the peas aren't sticking together. Place peas in a large bowl and set aside. Combine mayonnaise, sour cream, vinegar, salt and pepper in a small bowl. Add mixture to peas and gently stir with a rubber spatula until well combined. Gently stir in the crumbled bacon and cheese until combined. Add more salt and pepper, to taste, if needed.